I don't know why but lately I've been thinking about reimagining a couple of books in classic literature. Updating them really. Again I don’t know why and it isn’t because of some want to be like the Spiderman movies. I just so happened to read an article about originality from the blog The Thing About Flying (Warning: the post is not about books but about music but about being creative none-the-less). I won’t give away my first inspirational thought into the updating classic literature but I will my second. 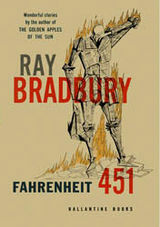 What if we updated Fahrenheit 451 by the late, great Ray Bradbury? What would this world look like? I imagine, instead of a world where the firemen go on burning books, it is where digital hackers are sent in to rid the world of their evil. Where instead of reading webpages they are all interactive video. New is broadcast on the internet and never read. Instead of hiding books in nooks and crannies to be glanced in on, Guy could have a password-protected server hidden in a cold dark basement room. He could be sneaking peaks at the written word and when his wife walks into a room he quickly turns off the monitor like a teenager about to be caught by his mother sneaking peeks at adult websites. There would be no printed word, just video displayed on a paper like product to be thrown away (we are working toward that technology, and this link was back in '07). What would they do when they came across a physical book? The printed word? Please reblog this and tell me what you'd think would make a great remake?